Welcome to Town + Country Volkswagen, your number one dealership for all your Volkswagen products, services, and vehicles in Unionville. At Town + Country Volkswagen, we want to help you find exactly what you're looking for in a relaxed and enjoyable atmosphere. At Town + Country Volkswagen, you'll discover a passionate team that has the satisfaction of its customers at heart and a modern showroom where you can learn more about brand new Volkswagen vehicles. 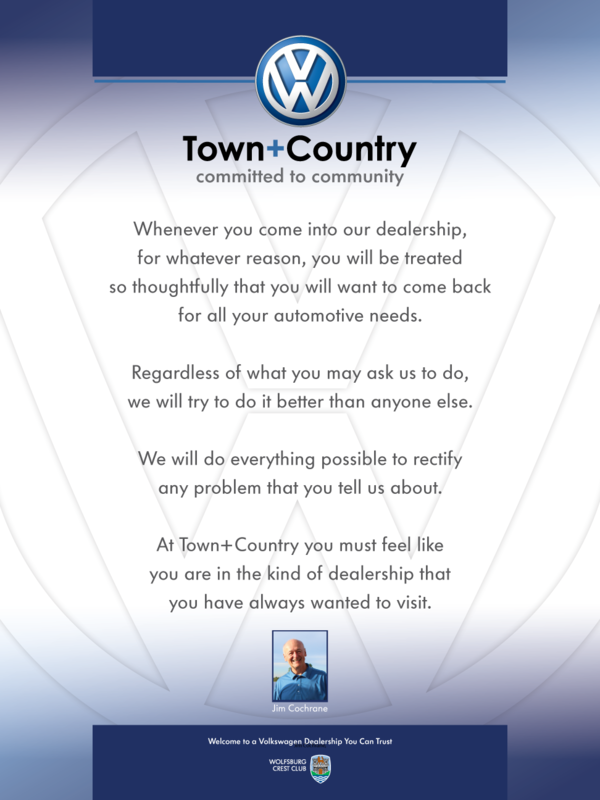 At Town + Country Volkswagen, customer service and respect are always at the top of our agenda, and we want to ensure your complete satisfaction at every visit. At Town + Country Volkswagen, the quality of our customer service is important to us. We have a vast selection of new Volkswagen vehicles to offer and a team of sales representatives who are happy to help you find the Volkswagen vehicle best suited to your situation and budget. For a new Volkswagen Tiguan, Volkswagen Atlas, Volkswagen Touareg SUV, and Volkswagen Jetta or Golf, come to Town + Country Volkswagen today. We also have plenty of Volkswagen Certified Pre-Owned vehicles on offer and flexible, affordable financing solutions. At Town + Country Volkswagen, we always look to go further for the satisfaction of our customers. Whatever your needs, you can trust us at Town + Country Volkswagen. Whether it is our service department or our Volkswagen Original Parts and Accessories department, everything is made to ensure your satisfaction. We also offer a wide range of products and services that ensure the quality and reliability of your Volkswagen, and you will always be impressed by the quality of our work. At Town + Country Volkswagen, we must always strive to exceed the expectations of our customers. We are here for you and are ready to help at a moment's notice. Come meet our team today.